St. Claude de la Colombiere was born near Vienne in 1641. He entered the Society of Jesus in 1659, and after fifteen years of religious life in the Jesuits, he made a vow as a means of attaining the utmost possible perfection, to observe faithfully the Rule and constitutions of his order under penalty of sin. Those who lived with him attested that this vow was kept with great exactitude. He was a good holy Priest and confessor, as well as a spiritual director to many. Claude was made Superior at the Jesuit house at Paray-le-Monial in 1674, where he became the spiritual director of St. Margaret Mary Alacoque, and was then a zealous apostle of the devotion to the Sacred Heart of Jesus. In 1676, he was sent to England as a preacher to Mary of Modena, Duchess of York – who became Queen of Great Britain. The official residence of the British Monarchy was the Court of St. James, and even there, St. Claude lived the life of a religious. He was as active a missionary in England, as he had been in France. Although he encountered many difficulties, he was still able to guide St. Margaret Mary by letter. 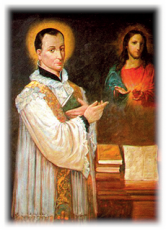 St. Claude’s zeal soon weakened his vitality and a throat and lung infirmity seemed to threaten his work as a preacher. While awaiting his recall to France, he was suddenly arrested and thrown into prison, denounced as a conspirator against the English throne. Thanks to his title “Preacher to the Duchess of York” and to the protection of the King of France – Louis XIV, who knew Claude, was he able to escape death but was condemned to exile in 1679. The last two years of his life were spent at Lyon where he was spiritual director to the young Jesuits, and at Paray-le-Monial, where he returned to improve his health. His principal works including “Pious Reflections”, “Meditations of the Passion”, “Retreat and Spiritual Letters” were published under the title, “Oeuvres du R. P. Claude de la Colombiere, in Avignon in 1832, and Paris is 1864. He died on February 15, 1682 at the age of 41. He was beatified by Pope Pius XI on June 16, 1929, and canonized by Pope John Paul II on May 31, 1992. His relics are preserved in the Jesuit Church around the corner from the Monastery of the Visitation Nuns at Paray-le-Monial. St. Claude de le Colombiere was born near Vienne in 1641. He was a holy man that studied and became a Priest with the Jesuit Order. He practiced heroic virtues in adhering to the Rules of his Order, and wanted to obtain the highest level of perfection possible. He became the Spiritual Director to St. Margaret Mary Alacoque. He was sent to England as a preacher to Mary of Modena, Duchess of York – who became Queen of Great Britain. He eventually spent the last two years of his life as spiritual director to the young Jesuit Priests back in his motherhouse in France. He died at the age of 41. Pope John Paul II canonized him on May 31, 1992.